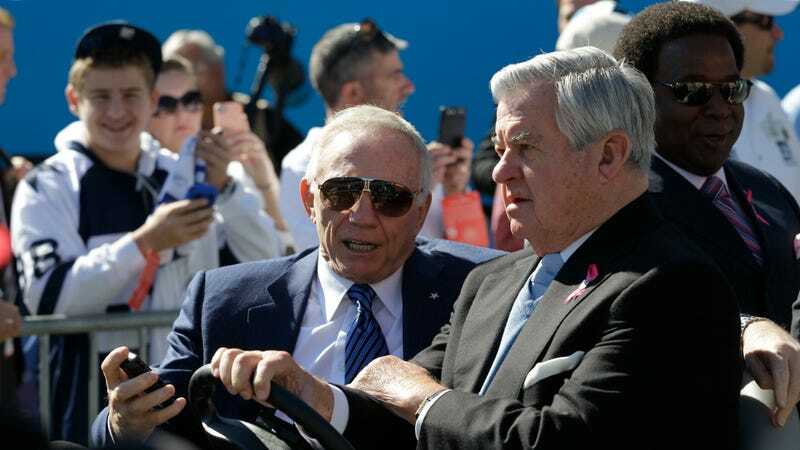 Cowboys owner Jerry Jones was asked to comment on the reports of sexual misconduct and racism that led to Panthers owner Jerry Richardson putting his team up for sale yesterday. Jones made it clear that the whole situation has made him very sad, not for the women that Richardson is said to have sexually harassed, but for Richardson himself. Not that anyone should have expected a nuanced take from the guy who starred in these photos, but not holding the opinion that it’s actually good to have credibly accused sexual harassers owning NFL teams is a pretty low bar to clear, even for Jerry.